One-sentence summary: a strong debut featuring intelligent dragons, a resourceful heroine, an out-of-place cutting scene, and some disappointing plot contrivances. 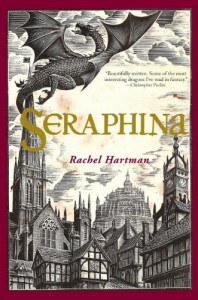 Seraphina was great fun to read: I looked forward to it every night. I enjoyed how compatible Phina and Kiggs were, and the idea of smart dragons is truly awesome. But in the end I didn't feel as passionately about this story as I wanted to. My enjoyment especially diminished toward the end, when I thought the the plot wrapped up without much of an emotional punch. Phina hates on herself too much. Rachel Hartman is doing wonderfully in terms of the craft of writing, but there were still traces of "debut" in this. For instance, I think she wanted Phina's character growth to revolve around accepting her dragon heritage, and discovering herself as a valuable person, but she achieves this by "telling" us how much Phina hates herself in the beginning. UGH with Seraphina calling herself a monster and "disgusting," already. It's a tired trope in YA for the beautiful, competent heroine to openly hate on herself. Show this to us in how she behaves, not in what she says. Here, the stated self-loathing flies in the face of Phina openly appreciating many of her strengths (being smart, being musical, thinking on her feet well), and her demonstrated competence. In fact, in some ways it seems like her self-loathing is there to 1. keep her from being more or less perfect, and 2. keep her from giving up the game to Kiggs too soon (see "plot contrivances" below). Also, another UGH with Phina's hating her mother for having her. It's ham-handedly planted so that Phina can forgive her at the end, and understand her mother's sacrifices for her. It feels like another trope. Who actually has this feeling in the real world? If you hate yourself, do you actively blame your mother for your existence? An odd cutting scene that I would have...cut. I call it a cutting scene, but it was actually Seraphina removing scales, despite (or rather because of) the pain it was causing her. It uses the language we're used to surrounding cutting (for example, it provides her with some emotional relief). But it came out of the blue, at a point in the action when it made no sense. Why is she doing this now? Why had she never tried it before? I'd have found it believable in Phina's character that she might want to experiment in a clinical way with removing her scales, but to me she didn't seem to have the symptoms of a girl who cuts. (Disclaimer: I'm absolutely not an expert on this topic.) I think Hartman wanted us to believe that Seraphina experienced the mix of anger, guilt, rejection, self-hatred, worthlessness and loneliness that might lead to cutting, but in fact she depicted Phina as bustling and efficient and engaged with her surroundings, so the motivation to cut seemed forced. If you look at where the cutting scene is placed, in an outhouse at a random moment in the action, it feels as if it was was dropped in after the fact--as if Hartman had a determination to include it, and had to squeeze it in somewhere despite there being no organic place for it, emotionally and chronologically. Where does the theme of lying fit in? I wrote in my copy "Too long, the lying." I mean, not only is it hard for an author to sustain reasons for the main character to lie to a truly decent guy for ages and ages, but the theme of lying in general is muddled here. Seraphina's mother's "crime" is that she lied to her husband about what she was; that's enough to have Phina angry at her, even though her mother made that decision out of love. Seraphina's dad lies to everyone about what Phina is and who her mother is to protect her. Phina's lying both gets her into trouble and saves her. So what exactly is the theme of lying doing for us? Maybe the real problem is that these three characters (mom, dad, Phina) were presented as strong and independent individuals in the reader's eye--people who wouldn't cave in to convention--and that the prejudice against dragons felt explicated more often than it was shown. In a related note, I didn't believe for a minute that a man who was as fair as Phina's father--who defended dragons in court, and who loved a dragon/woman as passionately as he did--would feel genuinely weird about a half-breed daughter. His discomfort as a lawyer was also a stretch: in my reading, intermarriage seemed to be labeled a cultural taboo, not an actual crime. Belabored reveals. I kept feeling like the pacing was off, but then I realized that it was because we know things before the reveal, so scenes sometimes seemed to drag (even though it's not an exceptionally long book). For example, we wait a long time to confirm that the rogue dragon is her grandfather; and we've already guessed that Basind is there to watch Orma. (It was too convenient that Orma didn't see that, especially when the newskin would pop out with extremely lucid thoughts.) In some cases, Hartman should have cut out the reveals that the audience already knows. Plot contrivances. There were lots of smaller overly-contrived plot devices, like postponing asking someone something important, and not letting the Pygegerian dancers dance, and not touching the grotesques in order to have visions you need. I was disappointed when Phina followed the instructions on a note written in unfamiliar handwriting saying that Glisselda wants to meet her in the second laundry room. The Phina we know isn't that trusting, especially about an instruction that makes no sense. (a princess wants to meet you in the deepest recesses of the basement?) In the final action scenes with Kiggs, there was a lot of "we were too dumbfounded to move/think"--e.g. when Glisselda is hoisted over Imlann's back. I'm thinking Kiggs would be very quick at lunging--faster than it takes Imlann to throw a girl over the shoulder and wobble down a flight of stairs. And then when it's convenient to the plot, suddenly the stalling is gone. "I've wanted to find them," Phina says about the other half-breeds when she's asked whether she can marshal them as troops. And Basind shows up as a dragon (finally) during the air battle but then changes back (what was the point of transforming into a dragon?) and basically says, "I don't have to be here at all, my job ended when the Ardmagar ordered Orma's excision." So why is he there? And finally there's the contrivance that Seraphina doesn't open her father's memory box until the exact right moment, with the usual "I can't deal with opening this" excuse to delay the action. It seems pretty important that the prince saw Phina sing at her father's wedding, all those years ago. Why didn't we know that Phina even sang at her father's wedding until Kiggs tells us the story? That information should have been planted earlier. "Their well-tailored but sturdy woolen clothing spoke of money mixed with practicality." 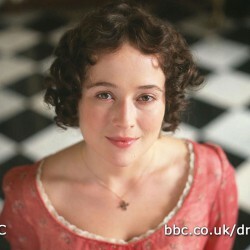 "But she was of an antique school that equated fine manners with elaborate rituals." "Now, all I saw were more things to love about him, and it made me sad." "There must be repercussions within the lawyer's guild for lawyers who break the law [my emphasis of course]." If you like this book, then you'll like...In her "Queen's Thief" series, Megan Whalen Turner does some similar world-building but more skillfully. Turner's world is vaguely medieval feeling, like the world of Seraphina, but in her case it's also vaguely Mediterranean. You have the sense that Turner has taken the real world and re-imagined it. This has the effect of grounding her setting--she clearly has the countries' maps in her head--while also making them feel original. By inventing a religion that feels Greek-myth in flavor, but is not those precise myths, she creates a culture that feels familiar and strong, but is also its own thing. And finally, there is much more moral ambiguity in the "Queen's Thief" characters, which Seraphina was lacking. It's much more of a triumph when authors get us to care about flawed, competing, or even evil characters (think Game of Thrones) than when they craft nearly perfect players for us to admire. In sum. Hey, this was a really cool book. A wonderful cover, too (here's to more illustrated covers in the world). And it's nice to have a strong female character. I only wish the self-hatred hadn't been painted on, after the fact.